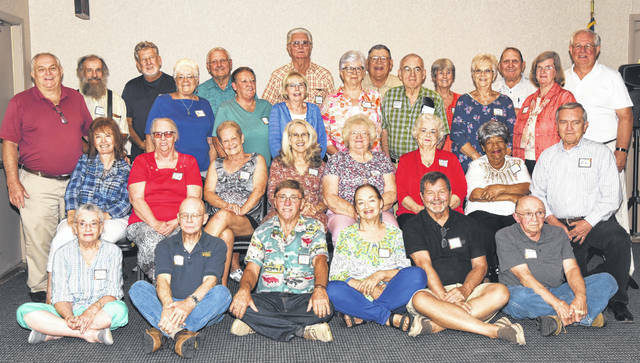 The Hillsboro High School class of 1963 recently held its 55-year reunion. Pictured are: (front row, l-r) Susan (Mays) Smith, Bill Bennett, Terry Cole, Marilyn Hiestand, Frank DeBold and James Walsh; (second row, l-r) Barbara (Tener) McCann, Sharron (Lloyd) Griffith, Jean (Shepard) Wilson, Cecalla (Cook) Dougan, Judy (Thompson) Hopkins, Karen (Glaze) O’Rourke, Teresa Williams and James Hamilton; (third row, l-r) Buck Wilkin, Marcia (Green) Morris, Judy Thornburgh, Joyce (Shelton) Cornellius, Pauline (Brown) Rand, Howard Graybill, Sandra (Yarger) Crum and Patricia (Channey) Young; (fourth row, l-r) David Ludwick, Gary Pitzer, Joe Stanforth, Nelson Dotson, Vickie (Davidson) Harris, David Purdin and Dale Burton. https://www.timesgazette.com/wp-content/uploads/sites/33/2018/09/web1_DSC_6018-Copy.jpgThe Hillsboro High School class of 1963 recently held its 55-year reunion. Pictured are: (front row, l-r) Susan (Mays) Smith, Bill Bennett, Terry Cole, Marilyn Hiestand, Frank DeBold and James Walsh; (second row, l-r) Barbara (Tener) McCann, Sharron (Lloyd) Griffith, Jean (Shepard) Wilson, Cecalla (Cook) Dougan, Judy (Thompson) Hopkins, Karen (Glaze) O’Rourke, Teresa Williams and James Hamilton; (third row, l-r) Buck Wilkin, Marcia (Green) Morris, Judy Thornburgh, Joyce (Shelton) Cornellius, Pauline (Brown) Rand, Howard Graybill, Sandra (Yarger) Crum and Patricia (Channey) Young; (fourth row, l-r) David Ludwick, Gary Pitzer, Joe Stanforth, Nelson Dotson, Vickie (Davidson) Harris, David Purdin and Dale Burton.